...Our very own Agent Capt Starfox came out on top. The entire CFC was called to highsec for Burn Jita by The Mittani himself. Our nullsec guests were made to feel welcome. Still, the New Order had the home-field advantage, and Capt Starfox showed them how it's done. 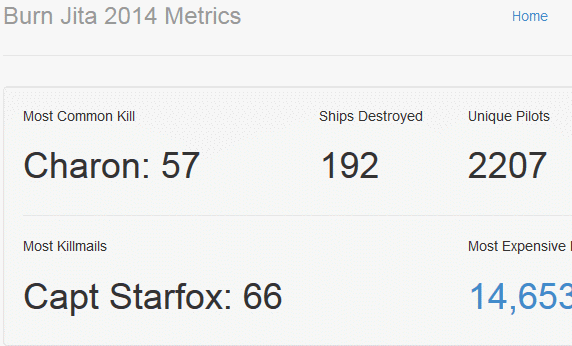 Congratulations to Starfox and everyone else who took part in the fun-filled, torture-free freighter massacre of Burn Jita. And as for the carebear freighter pilots: Smarten up. You've had the Code long enough to know better. Starfox is my hero! The wind beneath my --catalyst flaps! That's incredibly impressive. Kudos to Starfox. Was an awesome time, I'm just happy I had the opportunity to participate! Thank you everyone and thank you to the GSF/CFC members who made this event possible! 400lbs Some people just stop trying way too soon. Is this an INSULT Starfox forum? Ah yes, Capt Starfox. Not surprising the 'winner' of a high-sec ganking event is too ashamed to actually sport the CODE. banner. Don't worry Starfox, we don't blame you. In your haste to write an inflammatory post you forgot to call Capt Starfox a "400 pound overweight ganker". Next time, please be more careful. Carebear miners don't seem to mind what Corp I'm in when I'm shooting their internet spaceship. Think of the New Order as a coalition. Think of Starfox as NOT following his convictions and being too SCARED to actually join Code. I've had the good fortune of flying with Starfox many times, and can tell you he is the kind of eve player you want in your fleets. He understands game mechanics, is a blast to chat with on comms and via text - and as we can all see, he knows a thing or two about truly elite PVP. Three cheers for Capt Starfox! A BARREL ROLL. DO ONE. NOW. Yeah Starfox do the Barrel roll, should be easy with you being so FAT. I still think we need MOAR DOTS! Starfox attempts humor by showing he has the spelling capability of a 3 year old and that folks is the New Order Diplomat so you all know contacting that pr*ck is a waste of time! 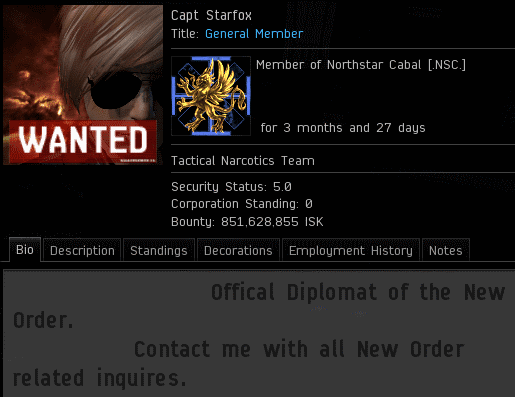 Congrats Starfox, The New Order and CFC alike are very fortunate to have you with us! lol I sound mad, don't I? Anon why not put your name up, when you want to put your views forward ( or are you ashamed) In eve I am mainly indy based, but like many enjoy the aspects and variety James brought to eve. A true miner will accept getting popped and move on from it. Anyone who believes HS should be 100% safe doesn't understand the sand box concept that EVE done for over a decade. And on a final note, unless the miners band and work together, then they can't do a thing to stop the NO from claiming legitimate office. Because the New orders running the show in HS. Not true NO is a pimple on high secs arse and that is all. Miners still and will always succeed and CCP will ensure that. Thanks CCP for all the buffs coming in the summer expansion!